Militants Shell Key Base Of Syrian Army In Northwestern Hama (Videos) 4.8888888888889 out of 5 based on 9 ratings. 9 user reviews. On September 5, unknown militants launched dozens of heavy rockets at a key base of the Syrian Arab Army (SAA) in the town of Jurin in the al-Ghab Plains. Syrian opposition activists claimed that the National Front for Liberation (NFL) was behind the shelling. However, the Turkish-backed group has not confirmed this yet. Hours earlier, NFL fighters destroyed a T-72 battle tank of the SAA near the Jurin base with an anti-tank guided missile (ATGM). The group said the attack was a response to the Russian airstrikes on the northwestern Idlib countryside a day earlier. In response to these actions, the SAA artillery shelled several positions of the militants in the towns of Jahabera, Tunah, Hawash, Khirbet al-Naqus and Qustoun in the al-Ghap Plains, which is located in the northwestern Hama countryside. The SAA and its allies are currently preparing to launch a large-scale offensive to neutralize the remaining militants in the al-Ghab Plains and several other areas in northern Lattakia and northwestern Idlib. According to Syrian pro-government activists, the offensive will begin within few days. lol, watch out SAA, concern yourself at defending Damascus instead of liberating Idlib because these ragheads mean business and will soon knock at the door of the capital lmao. SAA also mean business, these jihadists are the walking dead. Hajaj. I hope we can see these cursed jihadis as real life zombies in the series “The Walking Dead”. Then we can headchop them!!. Let’s see how they like it. Yeah disguised as ghosts, poltergeists maybe; they’ll be knocking but nobody will hear them. What an odd statement. don’t fake you don’t recognize irony, it’s not gonna serve you any good anyway. My apologies, I had misunderstood you. FUKUS is still providing missiles, ATGMs and satellite targeting data to the headchopping Orcs. Last video? Are those native Arab syrian accents or are they Chinese turkestani or maghrebi invader accents? RUSSIA needs to get their A game together,otherwise they will be left defeated and looking like idiots.Go for the Jugular. 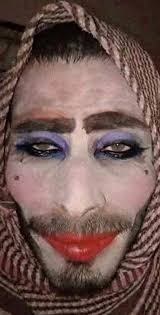 Seal the Border with Turkey to Create a Pocket… The Remaining Western Intelligence will be Captured without a possibility to Flee to Turkey Dressed up as Ladyboys….